And just like that… it is Monday again. Today, like most typical Monday’s, was crazy, emotional, and a little hairy, so I decided to write a quick post on something that makes me happy. 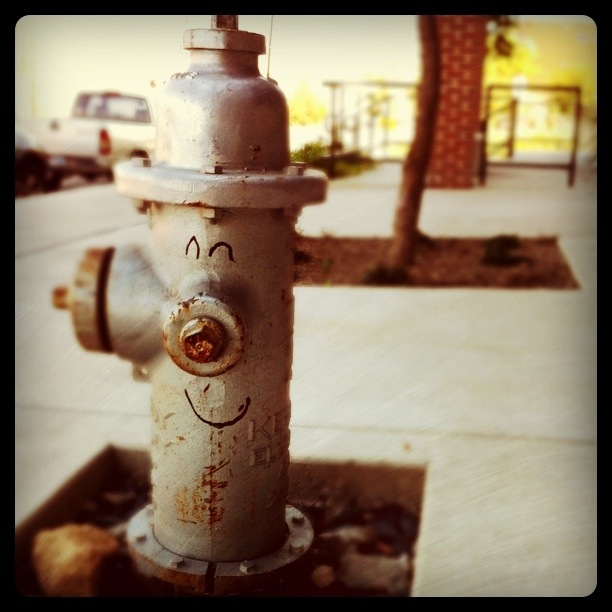 I’ve been seeing this little happy hydrant art around town lately, and all I have to say is… who ever is doing this, please keep it up. I love seeing this peacefully happy little guy as I walk down the street, he never fails to put a little smile on my face. Do you have a favorite street art ‘character’ or artist? Send photos to faithlovesaustintoo@yahoo.com and I will post them here! And so, now, one down… four more days to go. Have you seen the guy who carves peanuts? I found him through my blog/facebook. He’s pretty amazing and a total Austinite. how have I not heard of this guy?! I’m going to look him up! !